It's been awhile since the last time Rob and I came here in Canmore, I believe it was after Christmas for a few days and before that it was back in June of last year. We love coming here and thankful to Rob's parents, who a beautiful condo in this great town and let us use it when we need to get out of the city for a few days. If you read about what to do in Canmore, Alberta you will find many activities like skiing, biking, golf, horse back riding and more, but you can also do a whole lot of nothing like us:) I think we enjoy that the most because the rest of time our daily activites include alot of running around, working two jobs, taking care of kids and a dog and all the other fun stuff like cleaning, laundry, cooking....oh wait, back that up, cooking..not...Rob is the cook in the house and he is fantastic, he always puts 100% of creativity and love when making meals for us, and actually not just fantastic but i think he is the best cook. Now back to our weekend trip to this little town, there is alot of nothing to do like walking down mainstreet, going to tim Hortons, walking by the river, driving around with no purpose and watching alot of movies all weekend (mostly my choice of movies) and because my honey loves me so much he puts up with my girlie movies. When it comes to beautiful scenery, I can't wait for the summer to come when everything is so green, it is absolutely gorgious here and of course this is the time when I take so many pictures of almost everything, I think this is because I am not a huge fan of winter, or lets say: I do not like winter at all, but I do live in Calgary, AB - Go figure! Beautiful weather this time in Canmore; 18C outside. Rob and I took the dog and ourselves for a walk by the river. We took photos of ourselves and drewled over poeple's amazing little castles, I mean houses, by the river hidden in the trees, what a great setting - back yard on the river looking at the huge mountains. We took a quick walk through main street in Canmore and took a few portraits of ourselves there. 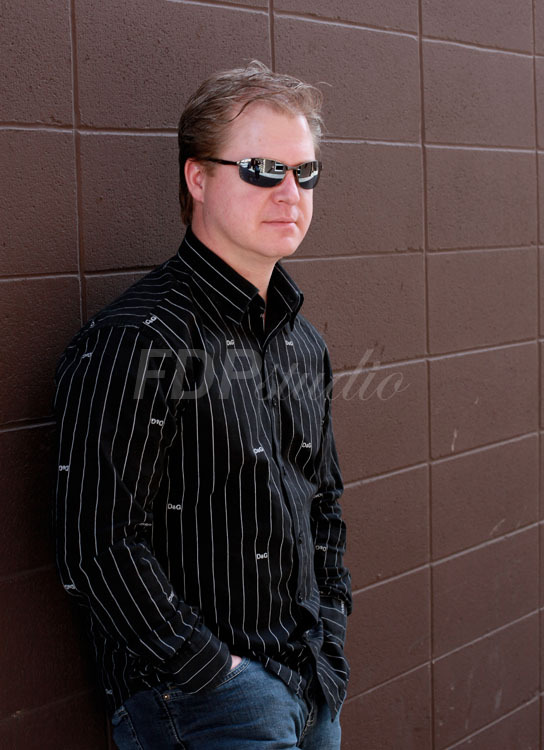 The weather was so perfect, I couldn't miss on taking a few portraits. 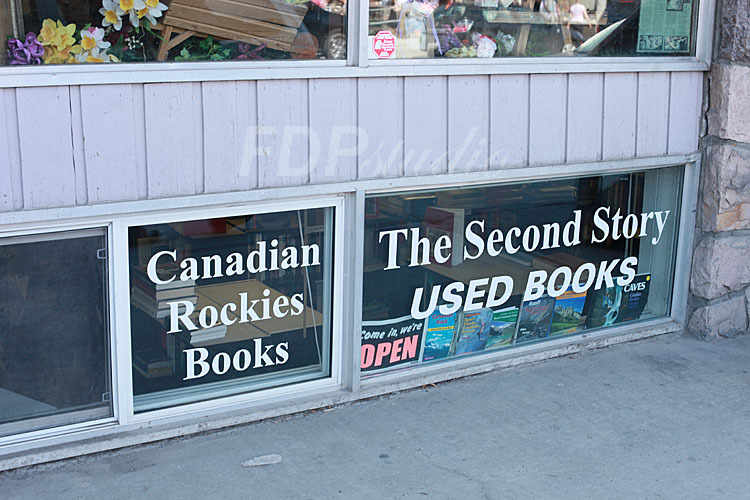 We didn't go to our favourite used book store, but almost always when we walked through downtown Canmore, we go to this book store, I love used book stores and so does Rob, we always buy a couple of books each, I mean $2/book you can't go wrong with. This time I just took a picture of the window:) for journalistic purposes of this blog. What a wonderful time, sunshine, walks by the river, photos and we are going to end the day with a BBQ and perhaps a late night swim in the pool. Faboulious weekend, fantastic food cooked by chef Rob, watching movies: can't ask for more, I am very lucky to have Rob in my life. Tomorrow is Sunday, which means that we have to go back to the daily grinds:( and back to work on Monday, not that I don't want to go to work, I just would like to spend few more days here relaxing with my sweetheart. 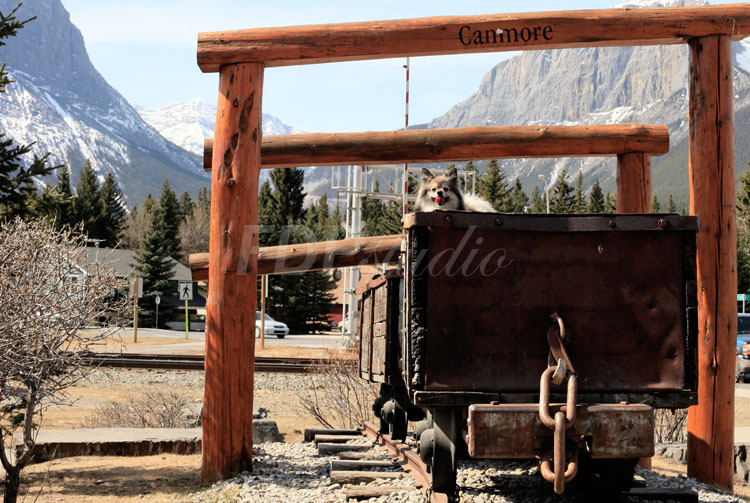 I am looking forward to the next time we are able to come to Canmore.